My film installation for Contour 2019is based on my personal history, as an attempt to let the past encounter the present and see further into the future of the post colonial situation, in both the Congo and Mechelen. 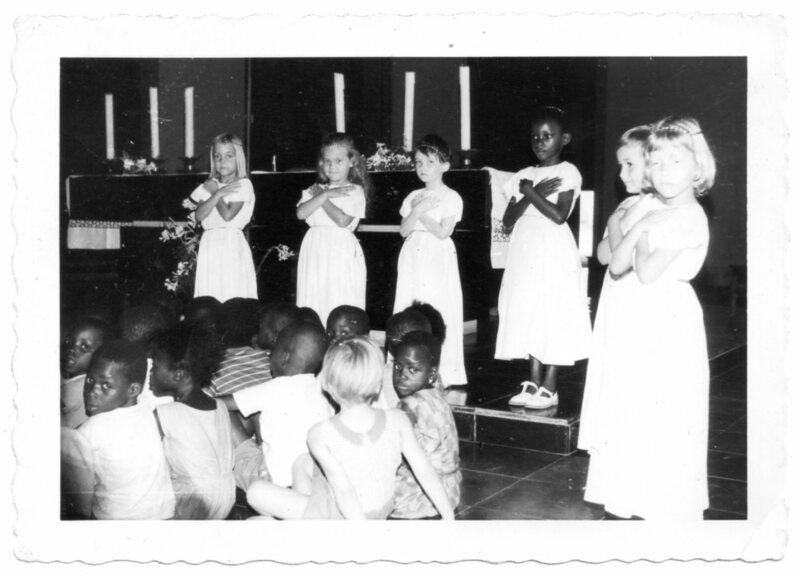 I was born and raised in Lovanium, the university of Kinshasa. When I was six or seven years old, I suffered a serious illness and would never have survived if I had not been a Belgian girl who had the chance of a cure in Belgium, which was always a dark shadow over my youth, but formed also my sense of justice. I intend to visit the university and the house in Lovanium where I lived, which is now the home of a Congolese professor and his family. Together with two filmmakers in Kinshasa I will make a video report of the encounter. In the film, the report will be juxtaposed with some of my old photos and memories, and with the text ‘Civiliser le Congo Belge: de la coercition à la persuasion’ of the Congolese historian Sindani Kiangu. In this text the education as form of civilization is questioned. In the film, past, present and future will be envisioned: how looking to the influences of colonization in the civilization of today, in Congo and more specific on the university? Does old Congolese civilizations still count? 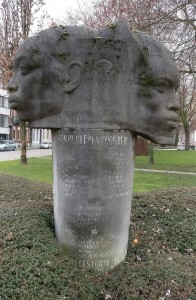 In mechelen, the colonial monument by Lode Eyckermans in the Schuttersvest pays homage to 31 ‘pioneers who died for the civilization in Congo’. One of them is Van Kerckhoven who was a very cruel commander during the reign of Leopold II. The statue is very intriguing, beautiful in fact, with two stylized Congolese heads, a male and a female, as a Janus image. It aesthetizes the African race and thus could rather be seen as a homage to it, which is in strong contrast with the inscription on the sockle. This only tells one side of the story, the Belgian one. Therefore I collaborate with Congolese people living in Mechelen and surroundings to come up with a new inscription for it. One that speaks about both sides of the history and thus acknowledges the impact of the Belgian reign in Congo. But that also demonstrates a positive view on the future, a society of equality and respect. Debates on this and on decolonizing in general took place during several meetings. The meetings will play an important role in the film, and will be intertwined with the family history of the artist and the images of her visit to the former Lovanium. Janus was the god of beginnings, gates, transitions, time, duality, doorways, passages, and endings. Looking to the past and to the future, Janus presided over the beginning and end of conflict, and hence over war, peace and exchange. Thus, he can figure as a good symbol for the project that I have in mind. This entry was posted in projects on 1 October 2018 by Bie Michels.